Last year, I had a good discussion with some teachers about Venn diagrams. 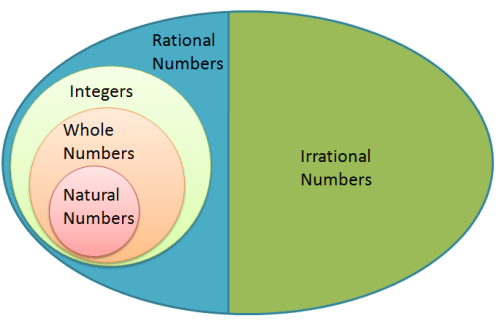 Several teachers commented that I should change the diagram below because it might give an impression that the number of rational numbers is the same as the number of irrational numbers. Sadly, I was not sure if I was able to explain my point. Anyway, below is an extended explanation to those comments. Are all objects with irrational lengths measureable? I was deleting old emails a while ago and I came across with questions from some students reading my blog. I have answered quite a number of questions from middle school and high school students via Email and Facebook since this blog started. I think some are worth publishing here, so I’ll probably post one from time to time. Below is the first Q & A in this series. Yes. In principle, they are measureable. The number line represents all real numbers. It contains all the rational and irrational numbers. In fact, there is a one-to-one correspondence between the set of real numbers and the set of points on the number line. This means that every real number has a corresponding point on the number line, and every point on the number line has a corresponding real number. Therefore, since we can locate every irrational number on the number line, we can find its distance from 0. This distance represents the irrational length. Before doing the proof, let us recall two things: (1) rational numbers are numbers that can be expressed as where and are integers, and not equal to ; and (2) for any positive real number , its logarithm to base is defined to be a number such that . In proving the statement, we use proof by contradiction. Assuming that log 2 is a rational number. Then it can be expressed as with and are positive integers (Why?). Then, the equation is equivalent to . Raising both sides of the equation to , we have . This implies that . Notice that this equation cannot hold (by the Fundamental Theorem of Arithmetic) because is an integer that is not divisible by 5 for any , while is divisible by 5. This means that log 2 cannot be expressed as and is therefore irrational which is what we want to show.